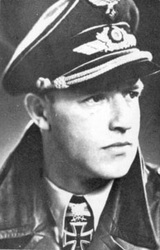 34 of Anton Hackl's 192 aerial victories were four-engine bombers. Gruppenkommandeur Anton "Toni" Hackl of III./JG 11 banks his Messerschmitt Bf 109G-6 over a formation of American B-17s from the 381st Bomb Group. On January 11, 1944 Hackl shot down two B-17s over Oschersleben. The 381st BG lost eight B-17s on the Oschersleben mission. Anton “Toni” Hackl was born on 25 March 1915. He transferred from the Army to the Luftwaffe and earned his wings in the autumn of 1936. Hackl scored his first two victories over RAF Hudsons on June 15, 1940 while serving with 5./JG 77 in Norway. Twelve days later he shot down another Hudson, but was wounded in this battle. In July of 1941 his unit was sent to the Eastern Front to take part in "Operation Barbarossa" which had commenced on June 22nd. 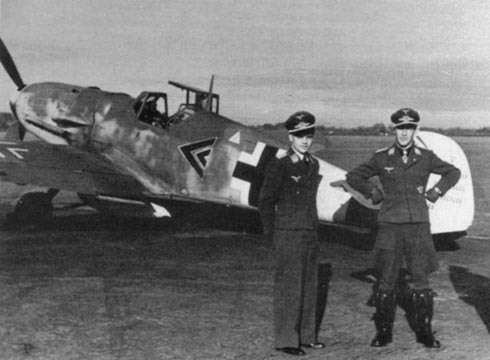 By then he had four confirmed victories and had been promoted to Oberleutnant. When 1941 came to a close his score stood at 27. On January 23, 1942 Hackl became Staffelkapitän of 5./JG77. He was awarded the Ritterkreuz (Knight's Cross) On May 25, 1942 after his 51st victory, July 1942 was a big month for Toni. He shot down a total of a total of 37 Soviet aircraft, all in the vicinity of Voronezh. He had an extraordinary day on July 21st and when he shot down six enemy aircraft and repeated the feat two days later. Hackl scored a triple on August 3rd to bring his score to 100. He received the Eichenlaub (Oak Leaves to his Knight's Cross) on August 6, 1942 after scoring his 106th victory. He was deployed to Tunisia with II./JG 77 where he gained 6 victories. American P-38 Lightnings got the better of him on February 4, 1943. He was badly wounded and out of combat for several months while he recuperated. In September 1943, he was transferred to Stab III./JG 11 which was part of the Reichsverteidigung (Defence of the Reich). On October 1, 1943 he assumed command of III./JG 11. Hackl was quite proficient at shooting down American heavy bombers and accounted for 25 four-engined during his tenure as Gruppenkommandeur of III./JG 11. Hackl knocked down two B-17s whilst flying his FW 190 on the 6th of March 1944 when the Americans launched their first large scale raid on Berlin. On April 15, 1944 he was shot down by American P-47 Thunderbolts and wounded but was back in action three weeks later shooting down a P-47 on the 4th of May and two B-17s on the 8th. 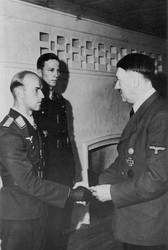 He was presented with the Schwerter (Swords to his Knight's Cross) On July 13, 1944. In July 1944, he became Kommodore of JG 76 and in October he took over of II./JG 26 By the end of the year his score stood at 172. He commanded JG 300 for a few weeks in January 1945 before returning to JG 11 as Kommodore at the end of February 1945. 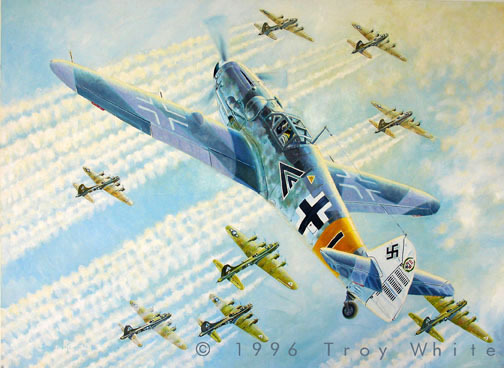 Despite overwhelming odds Hackl managed to score 20 confirmed victories in 1945. By May 8, 1945 he had flown over 1000 combat sorties, was shot down 8 times, wounded 4 times and scored 192 confirmed victories including 34 American heavy bombers. Toni Hackl died in his 70th year on July 9, 1984 in the town of his birth, Regensburg, Germany.